Price of AMD Phenom II decreased | Its Madh !!! These days , not only graphics card, processors are getting cheaper. Last weekend Intel decreased the price , now its AMD's turn ! So, AMD Phenom X4 II 920 from 182 euros, reduced over 14 %. 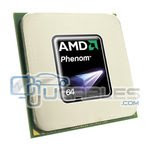 The high end model AMD Phenom II X4 940 Black Edition which costs around 211 Euro decreased to 14 % of its price. This price cut came faster than expected.